The holidays can be a wonderful time to take a break from your every day, connect with family and celebrate the good times that have passed over the year. 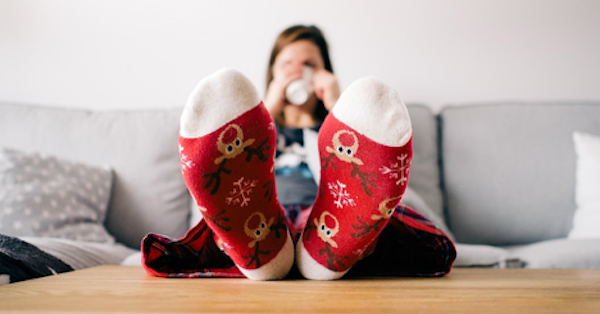 Unfortunately, the holidays can also be a cause of stress with things like hosting a guest in your house, organizing party plans, making sure to get the perfect gift, and so much more. The good news is that you don’t have to wait for Santa to receive the gift of holiday stress management. Here are twelve things that you can do right now to help yourself with holiday stress relief. Drink a glass of orange juice. Did you know that Vitamin C has been proven to reduce stress? * In a recent study, Vitamin C was shown to reduce the levels of stress hormones in the blood and other typical indicators of physical and emotional stress. So, grab a grapefruit, a glass of orange juice, add some chili pepper to that winter chili recipe. Your body will appreciate it. Like most cliches, it’s trite but true. Laughter is the best medicine and an incredible stress reliever. With the wide variety of ways to hear comedy nowadays, there’s no excuse to not give it a listen and give yourself a laugh. So, put on that Netflix comedy special, look up your favorite comedian on Youtube, or listen to the latest comedy releases on Spotify. Laughter and holiday stress relief are just a stand-up set away. Tea has long been used as a tool for stress relief. According to a study out of University College London, it was found that regular tea drinkers have nearly half the level of stress hormones in their body as compared to non-tea drinkers. Even the simple act of sitting down with a steaming cup, feeling the heat in your hands, and sipping little by little, can be a calming and focusing act. Chamomile, Lavender, and Peppermint teas are just a few of the best types of tea known for their stress relieving qualities. Jot down in a Gratitude Journal. Sometimes when we’re in the thick of stress, especially holiday stress, it’s easy to get lost in the needs and have-nots and start feeling overwhelmed. One of the best ways to calm yourself in these types of scenarios is to take a step back, recognize all the things that we already have, and say a prayer of thanks. A gratitude journal is a handy tool to have for those moments when you need a reminder of all the blessings that are already present in your life. Meditation doesn’t have to be an hour-long event in which you’re closed off in a dark room with your legs crossed and your hands resting on your legs palms up. It can be as simple as closing your eyes wherever you are and focusing on your breathing for 60 seconds. Picture something that brings you Joy. Picture yourself breathing in that Joy. And then, picture the negativity leaving your body as you release that breath. This mini mediation is a wonderful reset button that you can use whenever, wherever, and as often as you'd like. If you’re interested in developing a regular meditation practice, David Cooper Consulting can help you with that. Please see our mediation program at https://davidcouperconsulting.com/meditation. Our bodies have natural points where, if pressure is applied, our bodies react to it in strong ways. Often times because these are the points where we hold our stress. One such pressure point is called Extra-1 or Yin Tang. This point is located halfway between the ends of the eyebrows directly above the nose. To begin with the self-acupressure, start in a relaxed position. Place your thumb or forefinger on the Yin Tang point and apply gentle pressure in a circular motion for about 5 to 10 minutes. Try this or try massaging another natural pressure point found here: http://acupressurepointsguide.com/acupressure-points-for-stress-relief-and-anxiety. Try a restorative yoga pose. Yoga has a magical quality of both invigorating and calming the body at the same time. There are many simple and easy poses that just about anyone can get into in less than a minute. One of the easiest poses looks just like it sounds. “Legs up the wall” pose is very simple and ideal for stress relief. Start by setting up a cozy space around a wall with a pillow for your head. Get your hips as close to the wall as possible, then start walking your feet up the wall until your body is in a somewhat L-shaped position with your back on the floor and your legs up the wall. You can find a number of other stress-relieving yoga poses here: https://upliftconnect.com/yoga-poses-for-stress. Scents have the power to trigger memories, attract or repel others, and even affect our mood, including our levels of stress. Having a soothing scent or one that reminds you of a happy memory can trigger positive feelings. One great thing about our favorite scents is that there are so many ways that we can envelop ourselves in them. We can light a candle, add an essential oil to our aromatherapy, or fill our homes with flowers. So go ahead and use that powerful brain of yours to trick yourself into feeling calmer, even if you aren’t. Lemon, cinnamon, and rosemary are a handful of the most powerful calming scents. Give your pet some loving. Could there be a better or more joyful way of relieving holiday stress than showing your favorite pet some affection? Pets have the power to remind us to take a step back and remember what’s really important in life, like going for walks, sleeping in a comfortable bed, and of course, bacon! So give your best friend a hug and soak in how much they love you. Don’t worry if you don’t have a pet of your own, sometimes living vicariously through another can be just as fun. Ask a friend with a pet to send you a picture of them or watch a viral cat video. When was the last time that you said something nice to yourself? In your head or aloud? If you can remember, kudos to you, and keep up the great work. If you can't remember, don't worry, it's an easy thing to change. You can even do this right now in your own head! Sometimes we get so wrapped up in worrying if we're doing something wrong, we don't stop to acknowledge all the things that we've done right. So, while you may not be able to completely get rid of the bad thoughts that may enter our minds and cause us stress when you do something like overcook the turkey. But, you can always follow up that thought with a reminder of the beautiful welcoming space that you've created for your loved ones. Have you ever noticed how you can feel low and a song that you know and love comes on the radio and your mood immediately lifts? Music is extremely powerful in this sense. It can form our mental and emotional states even without the awareness of our conscious mind. A great way to use this to your benefit is to make a holiday playlist to bump up your holiday spirit. While you're cleaning, wrapping gifts, or cooking, throw on those tunes that lift your spirit. Find your inner Dobie Grey, listen to the beat, get lost in the rock 'n roll, and let your stress drift away. Extra stress relieving bonus points if you sing along. Although we like to think that stress is something that comes from outside of ourselves, the truth is that all of the stress that we experience comes from inside of ourselves. We create the stories in our minds that cause our stress. So, a wonderful way to get out of our stress is to get out of our minds. And a wonderful way to get out of our own minds is to stop thinking about ourselves and to start thinking about others. Is there someone you know that could use a little assistance? Is there something nice you can do for a loved one? You'll be amazed at the gifts you'll receive by relieving a little stress through an act of service. We hope that you give one or more of these tips a try whenever you feel that holiday stress level rising. Happy Holidays to you and your loved ones from David Couper Consulting! Melissa Schoenecker is a freelance writer and co-creator of the universe based in Venice, California. She received a Bachelor of Science Degree from the University of Wisconsin - Madison and a Master's Degree from the University of Santa Monica. She contributes to a number of blogs and online postings, but her best work can be found in her gratitude journal.